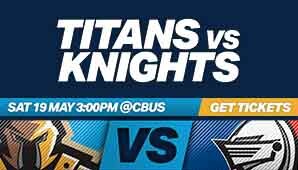 The TFH Gold Coast Titans’ face off against the Newcastle Knights on Saturday 19 May at 3pm at CBus Super Stadium! With new recruits Mitchell Pearce, Aiden Guerra, Kaylen Ponga and Connor Watson adding some serious firepower to an ever-improving Newcastle side, this fixture shapes as a real bell-ringer between two developing sides looking to crack into the top echelon of NRL teams. The super family friendly timeslot of 3pm makes this match a feature of your weekend! Bring the kids, the kid’s friends and their families to watch the pride of the Gold Coast go around representing our city! PLUS – enjoy a double dose of footy with a curtain raiser match from the Queensland Cup, with the TFH Titans feeder team the Burleigh Bears taking on the Easts Tigers!